CoreLogic’s study is based on analysis conducted on insured property throughout the Southeast. The firm says the study does not include damages from additional flooding, disruption of business or contents. After breaking down the data, 90% of insurance claims deal with hurricane damage caused by wind, while the other 10% is related to storm surge. When it comes to storm damage, 2016 has been a rough year. There have been 12 different weather-related disasters that have struck the United States this year. Each has exceeded $1 billion in damages. Only 2011 was a busier year with 16 storms. In addition to the huge amounts of damage in the United States, Hurricane Matthew was even more devastating in the Caribbean. More than 900 people lost their lives in Haiti as a result of the storm. 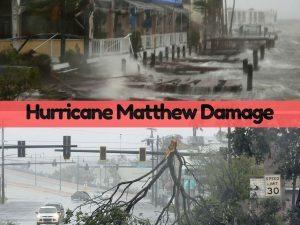 Matthew also left a trail of destruction in Jamaica, Cuba and The Bahamas. It was a further reminder of the power of a category 4 hurricane. It has been 11 years since a major hurricane made landfall in South Florida. Much of Broward and Palm Beach County suffered damage and power outages during Hurricane Wilma in 2005. Perhaps one of the biggest lessons learned from Wilma concerns insurance companies. Yes, we all need homeowner’s insurance to cover our losses from hurricane damage. Unfortunately, some insurance companies find ways to short-change their policyholders when it is time provide a settlement. Insurance companies are no different than any other business. They are trying to find ways to make and save money. In the case of a hurricane, insurance inspectors often rush to make their assessments. Because damage can be extremely widespread, many will cut corners by not thoroughly inspecting crawl spaces and other tough to reach sections of the property. While there is only so much time an adjuster can spend looking through every nook and cranny of hurricane damage, it is vital for the policyholder to receive the appropriate settlement to cover their losses. In far too many cases, homeowners are left with smaller than expected settlements. In some extreme cases, a claim may be denied. When this occurs, it is time to contact a claims insurance lawyer. A claims insurance lawyer can provide a public adjuster to properly inspect the property on your behalf. Their goal is to help each client receive the maximum compensation they deserve. Another goal is to settle with the insurance company without going to court. However, should the insurance company refuse to cooperate, having an experienced Miami claims insurance lawyer on your side is always a smart investment. To learn more, contact insurance claims attorney Jonathan Korin at Korin Law, P.A. and schedule a consultation today.